In the interest of length, I struggled with the decision to edit out the details of the provincial final. 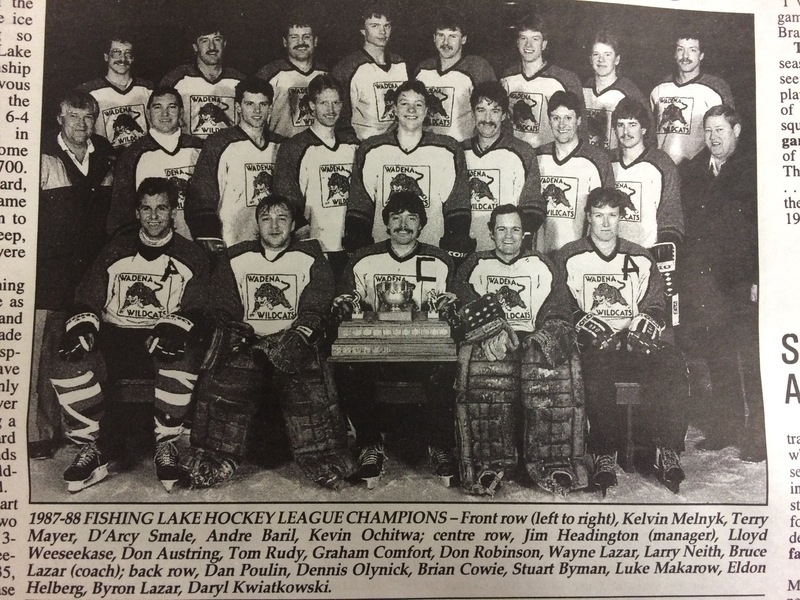 Knowing what true hockey fans the citizens of Wadena are, I was afraid that even those that remember the series like it was yesterday would be happy with nothing less than every edge-of-your-seat detail. 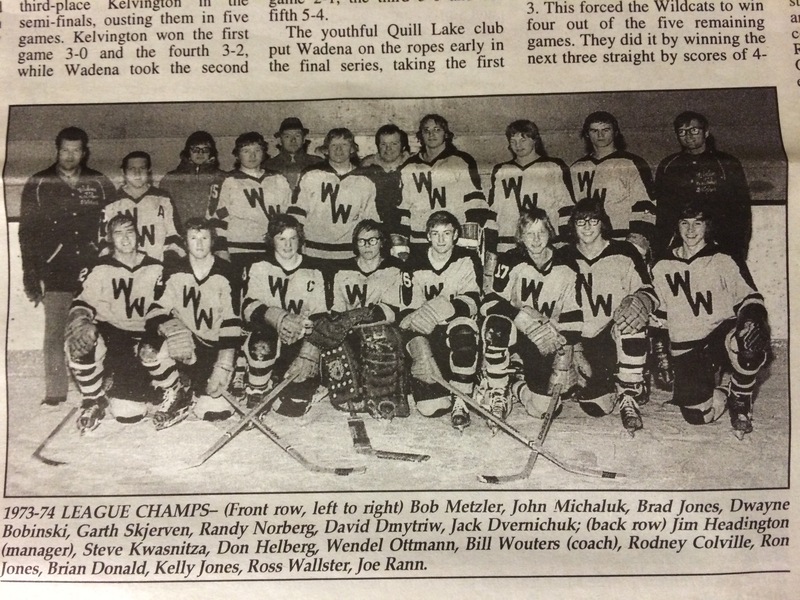 Unity had underestimated the team from the little town of Wadena prior to the series. 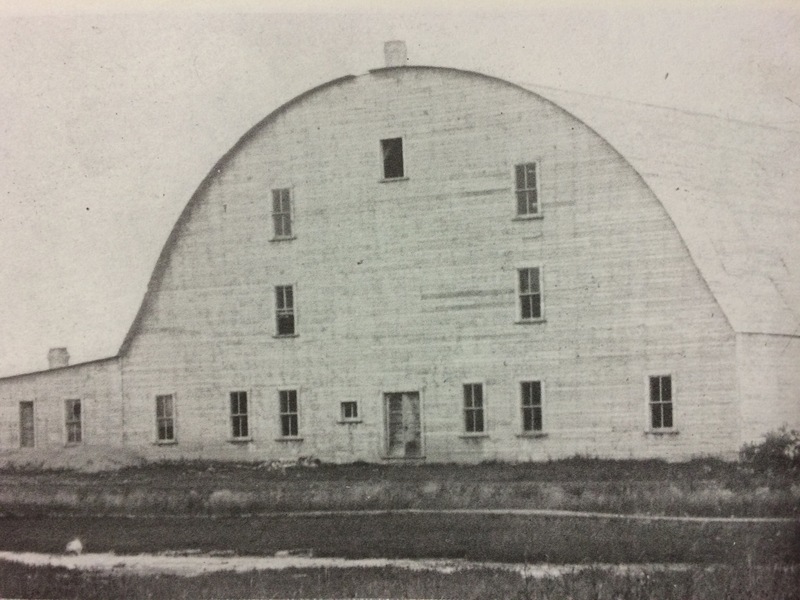 “Their league rivals, the Rosetown Red Wings, had won the Intermediate B southern finals, and because of the proximity of the towns and their rivalry, they had made arrangements to opt for SAHA provision that these two teams could play a best-of-three series for the provincial title once the Wildcats had been sidelined.” Unfortunately for them, this didn’t work out too well because Wadena beat visiting Unity 6-4 in the first game. In front of a passionate crowd back in Unity, the two teams battled all game before the hosts emerged with a 6-5 win. Even so, Wadena captured the northern title under the two-game, total-goals format (11-10) and advanced to the provincial final against Rosetown. The first game of the final was a bit of a shock with the Wildcats losing 12-2 at Rosetown. But the residents of Wadena did not give up on their team and the Wildcats put on an exciting performance back home in front of 1,500-plus fans. 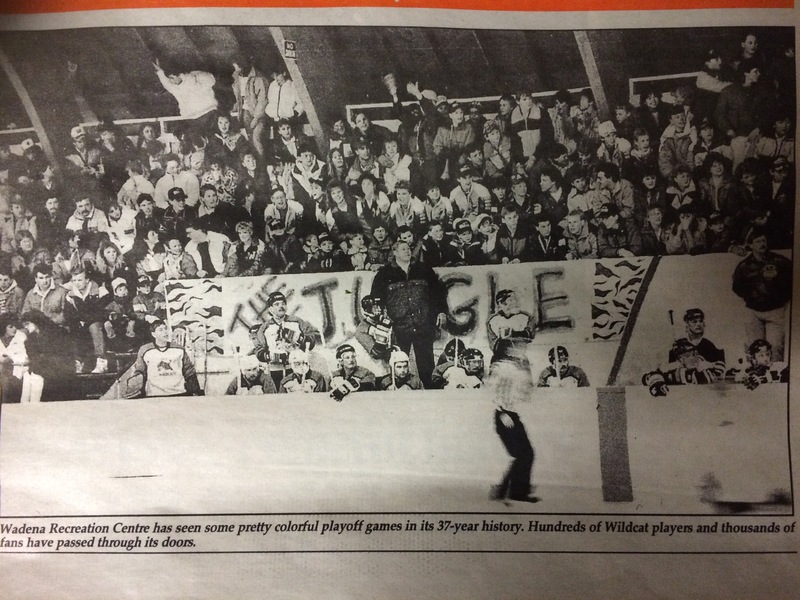 The local supporters delivered a standing ovation even after their team lost 9-7, which earned the 1979 team the title of Provincial B runners-up. 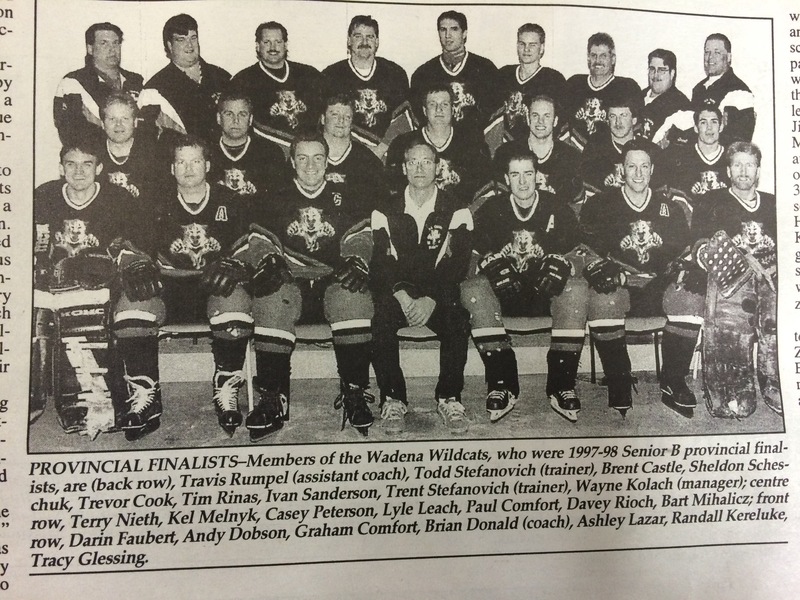 Not to be outdone in history making, the 1997-98 team took the Eastern Provincial Senior B championship prior to losing the provincial final to Lumsden in the third game of a best-of-three series. 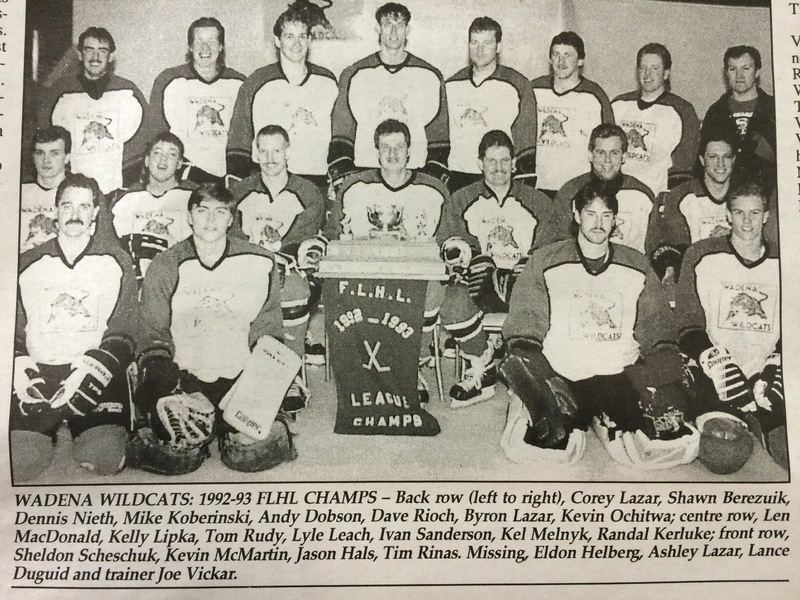 The 1998 Wildcats entered the provincial “B” category with mainly their league team and two imports from the surrounding area along with past Wildcat players from previous seasons. The first round would bring the Hudson Bay Hunters to town. The Cats would give up an early goal before cruising to a 6-1 win in Wadena and 11-8 two-game, total-goal series win. 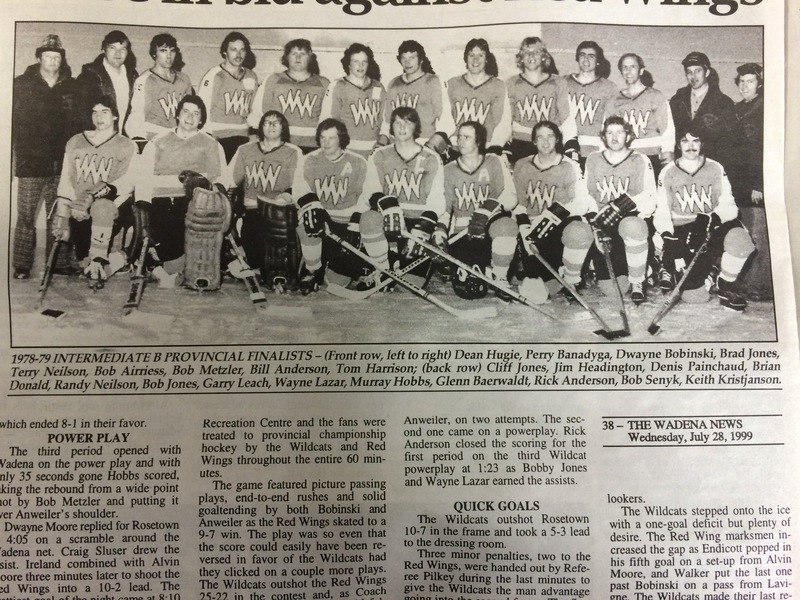 Next up was the FLHL rival, the Wynyard Monarchs. The series would be extremely tight the whole way with Wadena winning 2-1 at home and tying Wynyard 2-2 on the road for a 4-3 series win. 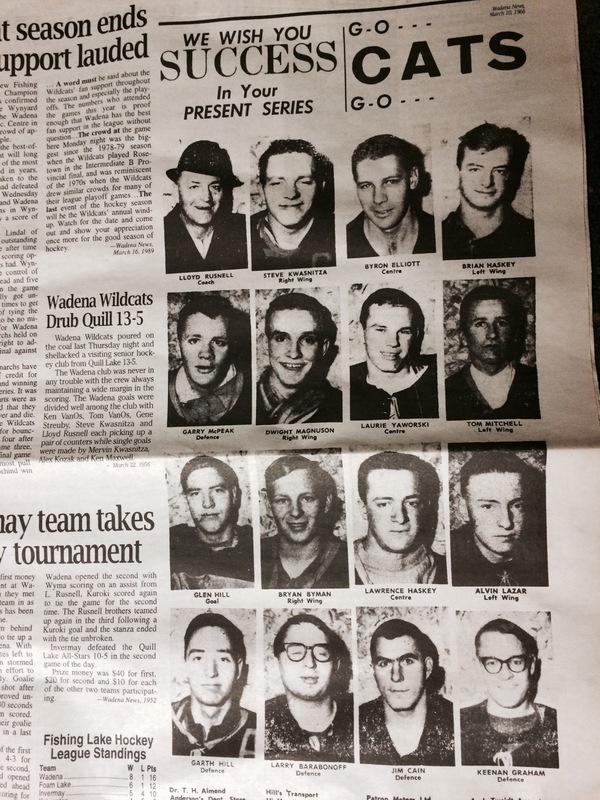 The Cats would enter the third round as underdogs to the Langenburg Warriors, a very strong team all season with many “big name” junior hockey stars. Wadena would manage a 3-3 tie in Wadena and, two days later, beat Langenburg 5-1 on the road to take them to the provincial semi final against Carlyle. Again, the wild back-and-forth series was coming. The Cats would lose 4-3 in double overtime at home before winning 3-2 in double overtime in Carlyle, bringing the deciding game three back to Wadena. The Wildcats showed their desire to win in this game, winning 3-0 and advancing the provincial final. The Lumsden Monarchs would eventually end their great season beating the Cats in the best-of-three final with back to back victories of 6-3 and 4-2 after Wadena had won game one 4-2. The Wildcat players have always been appreciative of the support they had that season, both at home and on the road. In their final four games at home, the rink was full from end to end during the warm-ups, something that was reported as unbelievable to experience. The roar as the Cats came out of the dressing room tunnel and when they scored was often deafening and something none of the players will ever forget. The Wadena Wildcats have had many ups and downs in the years in-between, winning some titles, losing others – but the heart of this town continues to be the players with a Wildcat on their jersey. We have successfully etched our mark over time as a town with hockey running through its blood. 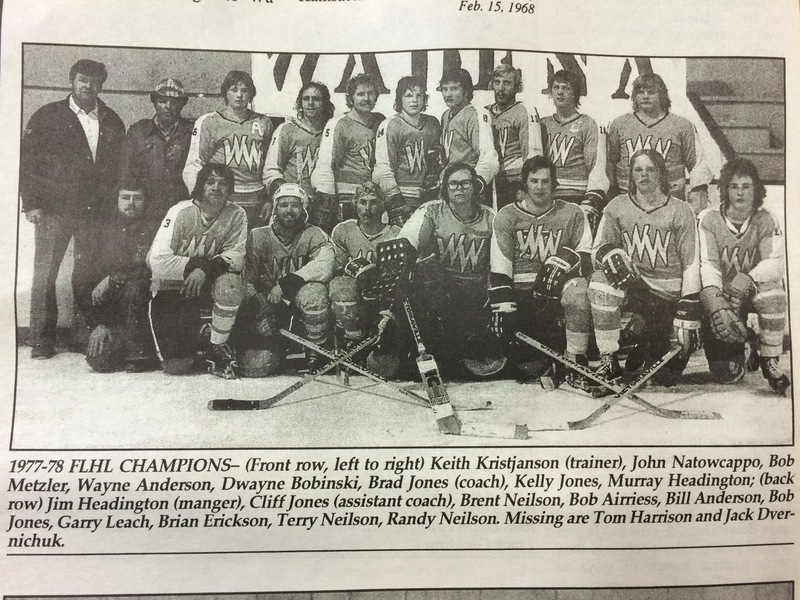 Enjoyed the memories of the hockey in wadena i hope there is more to come. There are a few more posts I have prepared leading up to Cameco Hockey Day in Saskatchewan that Wadena is hosting on January 13-17 2016. You can click the link on this page that says ‘follow Agriculture Today’ and enter you email address to get the follow up stories sent to your email. Or you can watch for them to be posted on Facebook. There is a page called ‘Hockey Day in Saskatchewan’ on Facebook (and Twitter) that will be posting these stories as well. I think these pictures bring back a lot of memories for all of us. Thank you so much for stopping in and reading!